The Victorians were the first to ‘discover’ the delights of boating on the Thames. In the late 1800s, they rushed to the river in their masses in skiffs, canoes, and punts, and even lived on it on their high days and holidays in palatial houseboats. Regattas were one of the results of their enthusiasm, and Wargrave and Shiplake Regatta was one of many on the upper reaches of the river in those days. We cannot, however, establish exactly when the first local regatta was held. We do know from the Berkshire Chronicle of August 31st 1867, that a Wargrave Regatta took place the previous Wednesday, August 28th, on a course from Bolney Island to Wargrave Ferry, under the auspices of Wargrave Yacht Club. However, the Parish Magazine mentions that this followed a gap of eleven years, suggesting that a local regatta had been held at some time in the 1850s and a silver rudder, engraved Wargrave Regatta 1856 , was recently found but no official records are known to establish the date of the first regatta exactly – and so we still take 1867 as our ‘official’ date of birth. The 1867 regatta was a brief affair, with only seven races in all. The programme started at one o’clock, and consisted of Watermens’ Pair Oar, Watermens’ Four Oar, Amateurs’ Four Oar, and Watermens’ Single and Double Punting. In those days, a distinction was drawn between amateurs and professionals, or artisans. These included those who worked on the river or who were manual workers receiving a weekly wage, and it was not considered fair that they should be allowed to compete against more refined amateurs, who received a monthly salary. Winners of the Watermens’ races received money for their efforts, whilst winners of the Amateur races received a silver canoe and a silver cigar case. The highlight of the day was a three mile race between the steam yachts Ariel, Nautilus, and Ethel. Ariel won easily. The 1888 regatta was without doubt the forerunner of the Wargrave & Shiplake Regatta as we know it today. The course for most of the races was from the Railway Viaduct to the end of Wargrave Lawn. Entries for the fifteen events were so high that a dozen preliminary heats had to be decided the previous day. Racing began at 8.30 on the Saturday morning, and concluded sometime after 6.30 p.m., with no breaks for either lunch or tea! Shocking. Higgs of Henley printed the programme, and the Fireworks started at 9 p.m. The Committee included Frank Wyatt, then landlord of The St. George and Dragon, and grandfather of Jack Wyatt, one of our umpires today; and Percy Hermon, great uncle to Val Hermon, President of the 1992 Regatta. Another family member, Cuthbert Hermon, also great uncle to Val, competed with distinction in at least two events. Competition was once again split between Watermen and Amateurs. This included single and double punting races, pair oar and veteran pair oar events. Most popular were the skiffing races for Gentlemen’s Double Sculls and Ladies’ Double Sculls, whilst other events included Lady’s and Gentleman’s Canadian Canoe, Gentleman’s Dinghy Race, an Open Four Oar Race, a “Canoe Race over Land and Water”, and the infamous Greasy Pole. Most importantly, 1888 saw the advent of Dongola racing, with an Open Dongola Race between three crews: The Little House (in red/white), Ash Tree House (in orange/brown), and The Vicarage (in dark blue). Sadly, we are unsure who won. The first ever dongola race had been held at Maidenhead in August 1886, the year after Lord Wolseley’s narrowly-lost River Nile campaign to the province of Dongola or Nubia, which gave rise to the tradition of dongola racing. The first races involved crews of eight: four ladies and four gentlemen, and remained so until the early 1900s. In the 1890s, Wargrave Regatta went from strength to strength. Based largely on the good auspices of local families and their guests, the event was almost more of an aquatic carnival than a serious regatta. The day always finished in the early evening light with a Display of Illuminated Boats, and all the houses and gardens along the river bank were lit up with Chinese lanterns. The Hermon’s at Inverlodden and the Walters-Bond family at Wargrave Hall were always praised for their efforts, whilst Percy Hermon was awarded the prize for Best Illuminated Boat in 1890. A band always played in the Enclosure during the day, and brightly-coloured flags and bunting adorned the course and marked the finish line. The Regatta was always held in the best of spirits. The “Lock to Lock Times” of September 26th 1891 reported on a wet Wargrave Regatta: “Nevertheless, ardent spirits were not to be denied the good day’s sport afforded by such a wilting obstacle as a wet day, and determined efforts were made to enjoy the racing.” However, things were not always in harmony. The 1891 Dongola final was between Wargrave (in white), Pangbourne (in green), and Shiplake (in harlequin). “In the first race, Shiplake were first past the post. On account of fouling, the Umpire ordered a fresh start. This caused considerable disagreement, the winning crew refusing to start afresh. When the Wargrave and Pangbourne representatives again tried the course, the verdict was in favour of the former.” Some things never change! By the late 1890s, interest in the regatta was expanding on the Shiplake side of the river. The “Lock to Lock Times” of August 29th 1896 records that the regatta “was greatly assisted by the co-operation of Shiplake Lock Islanders”, just as it is today over one hundred years later. Shiplake residents became gradually more involved in the running of the event, so that, in the early 1900s, it became known as Wargrave & Shiplake Regatta. By 1909, both the senior officers of the regatta, the Hon. Secretary and the Hon. Treasurer, lived in Shiplake, although the Committee comprised members equally from each village. Growth put increasing pressure on the crowded programme. In the pre-war years, Watermen’s races were actually held on a separate day two weeks after the main event to allow enough time for the less serious events, now including Scratch Dongolas, to be held, and to facilitate a sensible interval for luncheon. The number of spectators on the river was also giving the Committee cause for concern. A request was printed in the programme each year: “The Public are requested to help ….. keep the course clear”, as well as directives from the Thames Conservancy to all steam vessels, house-boats, sailing boats and barges to “take up positions on the Berks side, and moor head and stern for the day, and not to leave the position until the day’s racing is over.” A bell would ring prior to every race to signal for the course to be cleared. Seven Challenge Cups, all of which are still competed for today, were presented to the Regatta in these pre-war years. The Dongola Grand Challenge Cup was presented in 1908, whilst the Lawrence and Venture were given in 1912, the latter by Cornelius Vanderbilt. He owned a houseboat at Shiplake, which he used solely for Henley Royal and Wargrave & Shiplake Regattas. The Mardon, Rhylva, Quatermaine and Wargrave Challenge Cups were presented in 1913. So, by the outbreak of War in 1914, the Wargrave & Shiplake Regatta had become an established event. It was held under ARA, SRA, TPC and RCC rules; nearly 40 races were held; the Junior-Senior Skiff Championship of the Thames (The Lowe Challenge Cup) was competed for under its auspices; the train timetable from Wargrave to London was even printed in the programme. Vice Presidents included two Baronets, three Members of Parliament, and three JPs, and the Regatta was viewed as an important part of the up-river calendar. Conscious of the expanding popularity of Wargrave & Shiplake Regatta, a public meeting was held at Wargrave Hall on November 24th 1911, “for the purpose of considering the advisability of holding a local Regatta during the forthcoming summer” of 1912. In the Chair was E.A. Goulding MP, who had been President of Wargrave & Shiplake in 1911. The intention of the meeting, it appears, was to establish a more local event that could be limited to bona fide residents of the Parish of Wargrave. Accordingly, a resolution was passed that: “The Wargrave Regatta be revived in July 1912 ….. to be controlled by the residents” of Wargrave. This was to run alongside Wargrave & Shiplake, and to concentrate on being an aquatic festival purely for Wargrave people. It was not intended to compete with Wargrave & Shiplake, nor to detract from its special position – indeed, several local people became officers and supporters of both. Rather, it was to be an event purely for the village, and in fact it drew heavily on the Wargrave & Shiplake Regatta for the loan of necessary equipment. Lance Hannen CUBC was elected the first President, with Chairman – H.W. Willis; Hon. Treasurer – W.F.C. Holland; and joint Hon. Secretaries – F.R. Slade and T.A. Plowman. Several Vice Presidents were asked to act: Sir C. Henry, E.A. Goulding (later Lord Wargrave), J.F. Remnant, E.C. Hannen, P. Hermon and H.H. Morell Mackenzie. Amongst those who attended that first public meeting were W.H. Easterling, F. Bennett, and Dr. J. McCrae, then the local Wargrave doctor. The first Wargrave Regatta was held on Saturday July 20th 1912, with an Enclosure on the Oxfordshire bank in a field owned by R.C. Harrison of Shiplake Court, which was sub-let to Edmund Doble of Shiplake Rise Farm. Events were classified into Amateur, Non-Amateur, and General Sports (open to all). Amateur events were further split into Local events – “restricted to residents for the time being in the Parish of Wargrave, and their guests who are staying in their houses for the night immediately before or after the Regatta” – and Open events, for which this restriction did not apply. Double sculling, punting and canoeing races were held under each section, with a Dongola race only open to amateur locals. Tilting In Canoes, a form of ~”river jousting” in which canoe pairs attempt to turn over their opponents boat, was seen for the first time. Boats were hired from H. Butcher, Boatbuilder of Wargrave; tents were hired from Cooks of Henley for £4; a Mrs. Selina Smith paid £7 to be allowed to site her Fair next to the Regatta; and W.H. Easterling set out the landing stages, course and Enclosure. The Fireworks cost £25, and subscriptions amounted to £119.8s.0d. Although the day was a wet one, the Regatta covered its costs of approximately £125 with a total income of £155.4s.0d, and plans were laid early for another regatta in 1913. In fact, two more Wargrave Regattas were held prior to the Great War, July 26th 1913 and July 25th 1914. Both were successful, and far lower key than Wargrave & Shiplake. By 1914, the prizes were being displayed in Mr. Sansom, the draper’s, shop window for the week prior to the day. It was purely a village event, for the village only. In 1914, the Great War broke out, during which both regattas were halted. The Minutes of Wargrave Regatta record the burning down of Wargrave Church by suffragettes as another reason for calling a halt to festivities. Wargrave & Shiplake Regatta never re-started after the Great War. No reason is known for this. One can only surmise that it was not felt appropriate to re-start an event which had provided so much enjoyment to so many who fell in the Great War. Indeed, it took some months for interest in the lower key Wargrave Regatta to surface, but re-start it did. A “Meeting of Subscribers and those interested in the survival of the regatta” was held on June 26th 1919, during which it was agreed to hold a regatta that year, on Saturday August 9th. Val Wyatt, elected to the new Committee, proposed that the regatta should be more of a Water Carnival, a proposal that was carried. New fun events were to be added: mixed double paddling in dinghies; and boxing on a raft in comic costume. The resurrected regatta was a great success, although few records are known of its details. Many well-known local names formed the new Committee: Rev. Stephen Winter (Chairman), Vicar of Wargrave from 1914-1946; T.A. Plowman (Hon. Secretary) from Crazies Hill; J. Bushnell; A. Crampton, boatman from Val Wyatt’s yard; Charlie Lunn, barber from the High Street. The Regatta was repeated on Saturday August 14th 1920. The AGM for 1921 was held on Friday June 10th. By this time, it was becoming obvious that interest in the regatta was growing ever stronger, and it was accordingly proposed by E.C. Hannen, seconded by V. Vickerman, “that Shiplake be cordially asked to join.” This proposal was carried with acclamation, and the Hon. Secretary was instructed to liaise with past officers of the 1914 Wargrave & Shiplake Regatta Committee. His approach was warmly received. As a result, the two regattas formed a sub-committee of eight: four from Wargrave Regatta, and four from Wargrave & Shiplake, under the chairmanship of the 1921 President, E.C. Hannen, to discuss ways of merging the two events. It was agreed that the new Regatta would assume the financial liabilities of both, and that Challenge Cups previously held by Wargrave & Shiplake would be competed for at the new event. Sadly, no further details are known for 1921. A regatta was held on August 13th, but no records are known to exist of the new Committee or how the new event was organised. But one thing is for sure: Wargrave & Shiplake Regatta, as we know it today, had been born!! In the inter-war years, the Regatta flourished both as a sporting and as a social event. Gradually it grew to the eminence it had held before the War, and by 1922 85 races were being held, 30 on the Friday and 55 on the Saturday. However, growth was not achieved without wide discussion – one topic of constant consideration in Committee was whether the regatta should remain for the locals only, or whether it should open up more widely to all comers. In 1923, a resolution was put forward that entry restrictions to some events made the result of several races a foregone conclusion, whilst in 1924, a Mr. Robinson resigned his position on the Committee, being “not in sympathy with the arrangements for Open Events, which he considered should be abolished.” However, the events themselves were very similar to those we know today with sculling, punting, canoeing and Dongola racing all well established. Swimming races were also a feature – for Boys under 18, Boy Scouts, Ladies, and in 1930 and 1931, a Loddon District Rovers’ race. Junior events were introduced, with the Boys’ Pair Oar and Boy & Girl Double Sculling Skiff appearing for the first time in 1922 and 1923 respectively. Perhaps the most significant change during this period was the gradual erosion of the barriers between classes of competitors as the Regatta slowly moved with the times. By 1939, only two Non-Amateur events survived: double sculling and single punting, and these were reduced to only three races each. But things were changing on the river too. The Great War had ended the frivolous gaiety that so many had enjoyed on the river, whilst developments in powered boats meant a slow change away from the traditional skills of hand-propelled river craft. 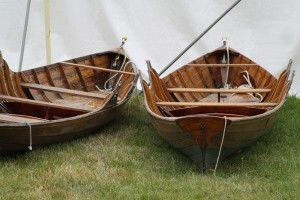 Boats became less easy to obtain: indeed, by 1923, the Regatta already owned three skiffs. So it was that the Regatta’s popularity began to wane slightly towards the end of the Thirties. The 85 races of 1922 became only 72 by 1939, with only 16 heats being held on the Friday evening. However, it was during this period that the “family” traditions of Wargrave & Shiplake became most firmly established. Whilst the general popularity of river sports may have lessened, they were just as important as ever to the families of the surrounding district to whom the river played such a big part in the spring, summer, and autumn months. Still there, were the established river families of Hermon, Wyatt, Bushnell and Burge. But now new names started to appear, names which still mean much to us today, and names which still figure largely in the competition and running of the Regatta: Sansom, Maidment, Harris, Harding, Warren, Bonser, van Zwanenberg and Symons. Cyril Sansom competed in Race No. 4 of the 1922 regatta: Boys’ Pair Oar (under 17), with C. Crampton, and A.N. Other as a cox. Cyril only retired from active participation on the Committee in 1988. In May 1936, Hugh van Zwanenberg was appointed to the Committee. In May 1946, following a gap of six years as a result of the Second World War, a close friend of his was also appointed – Mike Symons. In that same year, Hugh was elected Hon. Secretary, whilst in 1947, Mike was elected Hon Treasurer. These two names have probably had more impact on the development of the Regatta than anyone else either before or since, watching over the Regatta in these honorary roles for 34 and 33 years respectively. Clifford Maidment also joined the Committee in 1946 and stayed as a committee member until his death in 1997. The first post-War regatta was held on August 16th and 17th 1946. But it was quite a slow start. Entries for the 1948 Regatta were so low that it was held on only one day, with 83 races in total. In the early years, several events were sometimes held over, when entries could not justify their inclusion. But the Regatta has been an undoubted success story since then: an average of 125 races in the Fifties rose to 175 in the Sixties, and to 190 in the Seventies. Introduction of the Thames Dongola event in 1982 made the greatest impact on interest in the Regatta, however: by 1985, 240 races were being held, and by 1990 – only five years later – a record of 342 races had been reached. Some inevitably question the wisdom of such growth, but there can be no doubt that interest in traditional river sports has never been wider! The Regatta has seen many changes and developments in the post-War era. Although Tilting In Canoes was dropped in 1946 for lack of suitable boats, rag events were re-tried in 1958 with a Canoe Obstacle Race and Pillow Fighting on the Greasy Pole. In 1960, the course was reversed, with the Finish at the Railway Viaduct, to make such events easier. The Centenary Year of 1967 was the last in which a Fair was held, whilst in 1969, Regatta finances had decreased so dramatically that consideration was given to dropping the Fireworks Display. Social events are now held almost annually to augment the Regatta’s finances, whilst we still fend off any suggestions of commercial sponsorship. In 1981, Guy van Zwanenberg became Hon. Secretary, and Peter Symons became Hon. Treasurer, roles which they subsequently swapped in 1986 in line with personal abilities. Nick Jackson became Chairman of the Regatta in 1989 following the retirement of Jeremy Langton, who had held the post for four years. Thanks to the generosity of friends, subscribers, and well-wishers, the Regatta now has the finest fleet of traditional racing boats on the Thames: indeed, our boats are now loaned to several other regattas to promote their success and enjoyment. We believe that, today, we are the second largest regatta on the Thames.